Is your next door neighbor’s brother-in-law (who is in the IT business) talking about buying real estate yet? If so, chances are, we are the expansion phase of the market cycle. As we’ve discussed in previous articles on TampaBayIndustrialAdvisors.com, commercial real estate is cyclical by nature and will continue to ebb and flow into the foreseeable future. There are many macro-economic factors that contribute to changing values of commercial properties. The macro business climate, supply chain shifts, interest rates, supply and demand of existing facilities, and geo-political factors can all contribute to the supply and demand for certain types of commercial properties. While we have all heard that the first rule in real estate is ‘location, location, location’, we believe (and most industry veterans will concur) that it is just as important to consider ‘timing, timing, timing’. Determining the best time to buy and sell for your specific situation depends on a multitude of factors, many of which are related to your specific industry and your unique personal and business requirements. Market cycles should always be considered in that equation because timing can mean the difference between making and losing millions. 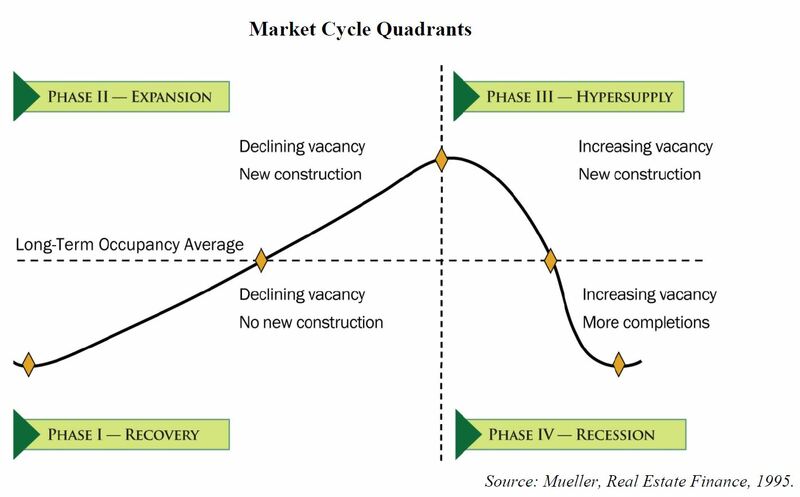 To help decode the process for you, the business owner/manager, we have highlighted the most common characteristics of the four distinct phases of the commercial real estate cycle: Recession, Recovery, Expansion and Contraction. Recession: The Recession Phase of the market cycle follows a market contraction. During this period, the availability of affordable financing dries up and property prices bottom out. Properties experience higher vacancy rates and owners are challenged to sell, lease, and finance their properties. We also start to see foreclosures increase in the market place. Indications that the market is moving out of recession can signal a good time to buy. Many times, property prices fall well below replacement cost, resulting in opportunities for investors with the liquidity and vision to take capitalize on bargain prices. This is also one of the best times to lease a property. Recovery: In The Recovery Phase, the market is improving and prices and rents begin to increase, although many buyers are still hesitant to proceed. More tenants enter the market and property owners refinance as affordable loan rates become available. Owners tend to improve their property and work to maximize rental rates. Prices are increasing. This is a very good time to buy because there are still some relative bargains and demand for space is definitely increasing. Expansion: During the Expansion Phase, the real estate market is improving and expanding and equity investors are plentiful. Financing becomes more readily available and the price of real estate may increase more than seen in previous history. Vacancies are at their lowest point and there is a general sense of well-being, prosperity and abundance. Everyone is talking about buying real estate. This is the best time to sell and the worst time to lease. Contraction (Hypersupply): The Contraction Phase is when vacancies are increasing and prices begin to fall from the peak of the Expansion Phase. The market has become over-saturated and financing is becoming less available and more expensive. Investors begin to withdraw from the market as vacancy and delinquency rates rise and prices decline. Foreclosures begin to increase as some owners are unable to meet financing obligations due to vacancies. Buying and selling decisions should be based on specific business need, unique prime property availability, and individual opportunities. When considering buying, selling, leasing, or developing industrial facilities, your analysis should always include some consideration for where we are in the market cycle. Discussing upfront with a trusted commercial real estate advisor shouldn’t cost you a dime, and most likely will provide valuable, market specific insight, giving you the edge you need to put together a winning deal for your company.